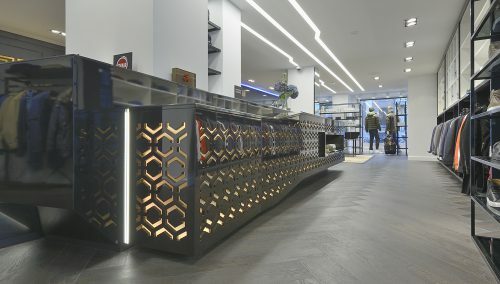 Incisive shop restyling – with success! 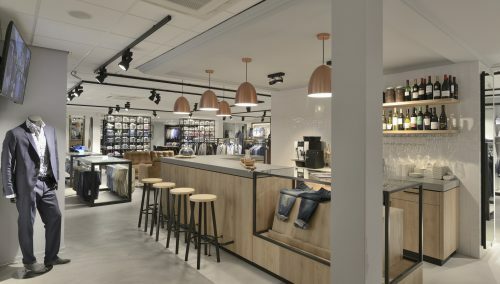 How a project was very successfully completed Edward Hidding, Marc Steenbergen and Ron Ylat of MarcEdwards approached WSB for an incisive shop restyling. Rick Blankenstijn, retail design & sales at WSB, got in the car immediately to check out the options for this former Tom Broekman shop. During the first brainstorm session, it became clear that the successful fashion shop had a few major opportunities and simultaneously was confronted with a large number of bottlenecks. In the first place, the front section of the shop seemed enclosing due to the alcoves, and did not look very progressive. The lighting was reminiscent of a solarium. The furniture was boring and the wall racks old-fashioned. Toward the back section, the dark corner of the counter top barricaded the key route to the suits department. In a very short time frame, the WSB retail designers provided a perfect plan with green elements, gold elements, classic warm wood structures in an appealing shop experience. The classy Botticino floor was left unchanged. The collaboration was perfect. MarcEdwards was even able to organise a mega weekend sale during the renovation works. How about after the renovation? The first weeks can be called truly outstanding. A big thank you for the great collaboration! You have a really amazing collection in there and WSB is definitely impressed with the professional way you are serving your customers. That is WSB’s motto too!